People will not get any benefits by getting involved in the power struggle launched by Maithri, Mahinda and Ranil and the JVP would commence the struggle on the road with the masses against the moves by Maithri – Mahinda – Ranil that destroy people’s lives in a bid to protect their petty interests says the Leader of the JVP Comrade Anura Dissanayaka. He said this at a special press conference held at the head office of the JVP today (29th). Already a life has been sacrificed at Ceylon Petroleum Corporation for the power struggle of Maithri – Mahinda – Ranil said Comrade Anura Dissanayaka and emphasized that the JVP would take the responsibility at this moment to build a people’s administration against the unholy power camp. The JVP Leader said already discussions have commenced with progressive people who are with Maithri, Mahinda and Ranil as well as left political parties, mass organizations, intellectuals, artists, professionals, entrepreneurs and progressive people to have a massive protest rally at Nugegoda on the 1st. The JVP Leader said as crowning Mahinda or crowning Ranil would not give any benefit for the people, an alternative force against Maithri – Mahinda – Ranil power camp should be built to act as an alternative force and said the media too should actively contribute to such a movement. 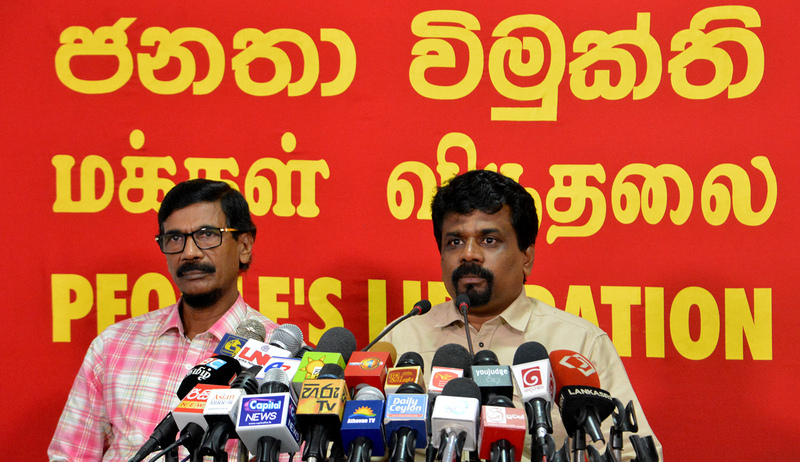 Comrade Anura Dissanayaka said, “Already a life has been sacrificed at Ceylon Petroleum Corporation for the power struggle of Maithri – Mahinda – Ranil,” said Comrade Anura Dissanayaka emphasizing that the JVP would take the responsibility at this moment to build a people’s administration against the unholy power base. The JVP Leader said crowning Mahinda or crowning Ranil would not give any benefit for the people, an alternative force against Maithri – Mahinda – Ranil power camp should be built to act as an alternative force and said the media too should actively contribute to such a movement. Comrade Anura Dissanayaka said, “People will not get any benefits by getting involved in the power struggle launched by Maithri, Mahinda and Ranil and the JVP would commence the struggle on the road with the masses against the moves by Maithri – Mahinda – Ranil that destroy people’s lives in a bid to protect their petty interests says the Leader of the JVP. He said, “What occurred on Friday was a political conspiracy. It has taken the country towards anarchy and instability. Despite several days have gone by since the conspiracy, it has not ended yet. Day by day the anarchy and the instability are getting worse. The people are getting uneasy. The consequences of the conspiracy are so drastic that two employees at the Ceylon Petroleum Corporation have been killed in a clash. The country has been dragged towards anarchy and the people are confused. This power struggle has not occurred due to the need of the people in the country. It is a power struggle to fulfill the needs of Maithri, Mahinda and Ranil. This political conspiracy carried out to get their power to beef up their power bases would not bring any benefit to the country or the people. We call upon the people in the country not to become shareholders of this conflict. The death of the CPC employee would not have any effect on the Ranil-Mahinda-Maithri power struggle. The door of the Parliament, which they themselves call the apex of democracy and the highest institution in the country, has been closed. Maithripala, without any shame, has prorogued Parliament as if he has entered a toilet and has closed its glass door. The likes of Dinesh Gunawardene, who delivers lectures on Parliamentary democracy are gallivanting around the toilet like guard dogs. We ask Maithripala to open the doors of parliament, which is the place where representatives of the people could express their views. Maithri has made parliament a partner of his political conspiracy. Laxman Yapa and others talk about closing down of parliament as if they are telling stories for small children. Isn’t a debate necessary regarding the prevailing situation? Suspending Parliament is a continuation of Maithri’s political conspiracy. As such, we sent a letter to the Speaker with the signatures of all six MPs of the JVP asking him to convene Parliament immediately. However, we do not believe that the crisis situation that has arisen can be resolved only by convening Parliament. We have to open another path to get the issues of the people resolved. We, as the JVP, have no right to become spectators to this unstable nature or the ugly voracious power gamble. Hence, the JVP will take steps to intervene against the power gamble. The incidents that occur throughout the island prove that Ranil-Maithri-Mahinda are rulers who would not be able to develop our country. Their power bases and those groups around them have proved that they are unable to take the country forward even by an inch. The people have been imprisoned in a death trap and their lives are being gambled to carry out the gamble for power. This gamble for power proves what Ranil’s, Maithri’s and Mahinda’s interests are. Hence, the need has arisen for a strong people’s movement that could find solutions for the issues of the masses. As the JVP, we call upon the people in this country, instead of being spectators or stakeholders to the conflict, to rally to build a broad people’s movement against the shameless gamble for power. This gamble for power should be definitely defeated. The JVP would take steps towards it. We call upon people to learn a lesson from these incidents. Political facts that cannot be learnt by reading thousands of books can be learnt from these incidents. We need not allow the future of our country or our children to be pushed towards an abyss so that the reactionary forces could continue their gamble for power. The time, labour and wealth of our people need not be wasted to strengthen power bases of Maithri, Ranil or Mahinda. The people should make sacrifices for a people’s power that would be built against these power bases. The JVP has already begun discussions with progressive forces, righteous people and the left movement regarding building a new people’s force. Also, we have discussions with mass organizations that came forward whenever there was a crisis in the country. We have had discussions with university dons, professionals, artists and other progressive forces in a bid to build a people’s movement to defeat the gamble for power. The General Secretary of the JVP Comrade Tilvin Silva too participated. Await for his views and responses to journalists’ questions.